I know that most of you know that I’m a big fan of Menu Planning and Shopping with a list! I’m also a fan of Freezer Cooking, but I’m not a fan of the Time it Takes to shop for and cook for a month! So I’ve come up with something that works much better for me. Weekly Freezer Cooking! Think of this as Meal Prep for the next week, You can shop for, Prepare and freeze all your dinners for the week in just about an hour! Then you’ve got something ready for each night of the week! We typically eat out one night a week, so 6 Meals is perfect for me and I’ve found I can quickly and easily prepare 6 meals in about an hour! My favorite part of Weekly Freezer Cooking is that I am not stuck with 5-6 of the same meal :) You can change up the menu each week, or if you would like to cook more than one of each meal you can easily double this shopping list and all the recipes! 1. Download & Print the Shopping List & Recipes, Make sure you check your pantry before you head to the store, you probably already have a few of the items you’ll need and there’s no need to buy extras :) Use what you have on hand first! That is a great way to save money! 2. I like to lay out all of my meals once I’m done shopping by ingredients. I just lay out each recipe, then pull out what I need so I can assemble the bags quickly. 3. Start by Cooking your Meat and Chopping up any vegetables. This will make assembling your bags super fast! 4. Label your Bags before you start filling them, it’s easier to write on them while they are empty. I always include cooking directions on the bag so I don’t have to track down the recipes each night. 6. Once you have all the bags in your freezer you’re ready for a busy week! I just pull out a new bag each night at dinner time for the next night, then I just have to place the meal in the oven or slow cooker that day! It’s so easy and a great way to stay organized and eat at home even with a Busy School-Year Schedule! 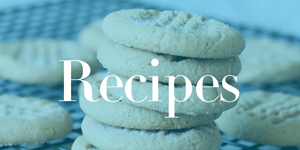 Download the Shopping List, Recipes & Directions Here! If you have a favorite freezer cooking recipe be sure to leave a link below! I’d love to try some new recipes + I’m hoping to do more of these Weekly Freezer Cooking Menus if you guys like them! Let me know if you would like to see more! Hi Mei, just click on the “Download Easy Freezer Meals Here” that’s in the blue rectangle and you should be directed right to the menu, etc to print! Enjoy! Hello, would love to try and get the recipe for my picky eater.. Thank you so much? I found this on Pinterest and I did each and every meal! They all turned out amazing and my family loved all of them, even my picky 7-year-old. I am now hooked on freezer meals. They have made my life 1000% easier! what are the freezing instructions for the ziti? You Freeze it before you bake it! So don’t cook it before you freeze it you will thaw and bake it later! Hi Christina, I just emailed you about this. Hi Hillary, I just sent you an email about this. Some of your instructions are not well written. On the first page, in the tips, you say to cook up the ground beef. Then later in the recipes, you say to cook the ground beef with the onions. The ziti recipe has many errors. In the ingredient list you call for 6 slices of provolone, yet in the instructions, we only use 4. You don’t mention parmesan in the ingredients but you call for it in the instructions. In the instructions, you mention using half of the sour cream, but when do we use the other half? There is no mention of freezing, so do you bake and then freeze, or freeze and then bake? I helped my sister put these together yesterday and this one was a little frustrating. Perhaps once you write them you should give them to someone to try before you publish. But great idea and hoping that they are a hit with my sister’s family. Hi, the links aren’t working, could you email me directly. Thanks so much! I can’t wait to try these. It looks like you don’t get emailed till a month later! This is amazing, I love how clear the shopping list and recepies are! Thank you ??? I’m a little confused by the baked ziti recipe. There aren’t any freezer instructions. Could you clarify? These look great! Could you email me too, the links don’t seem to be working? Thanks for this! Hi Tammy, I just sent you an email. I hope you enjoy the meals! For the baked Ziti. It’s doesn’t have freezer instructions. Do I thaw overnight and use the cooking Instructions provided or cook from frozen with those instructions? Thanks! Made this, loved it! I am going to try this. I need to feed 6 people. How many servings is your recipes ??? Like a few others, the links don’t work for me, but I’d love to check them out. Where are the recipes you did for the youtube channel? the freezer cooker ones? How long should I cook this if I put all the ingredients in still frozen? I couldn’t get the links to work. Can you Email me? I am confused on the baked ziti meal. When do you freeze? It looks like just regular recipe to me. And after you freeze, how do you cook? None of your links will work for me. Could you email me directly please. Hi Angela, I just emailed you. Hi Miranda, I just emailed you about this. The links aren’t working for me either..I wanted all of the recipes! Thanx in advance! Hi Stephanie, I just emailed you about this. Hello, none of your links are accessible for download. Can you please email me the shopping list and recipes? Thanks!! Can you comment again so I can get your email? I thought I sent it but now I don’t see that I did and I can’t locate it, I’m so sorry! Hi, I’ve enjoyed reading your article and can’t wait to have a go but am unable to open your links ? Also I’m from the UK so if there are any ingredients on your list that may not be available over could you suggest alternatives please ?? Hi Sue, I emailed you directly. im completely new to cooking. It says cooks your meat before hand… But it doesn’t say what temp or time.,. Could you tell me? If you are cooking ground beef I just place the raw ground beef in a skillet on my stove and cook it through until the meat is no longer pink. For chicken, there are several ways to cook the chicken. Two of my favorites are poaching or boiling it on the stove in water or chicken broth or my absolute favorite is cook it in a slow cooker. Just look up methods of cooking chicken breasts and that will give you all your options. Hope that helps! This is so awesome! Do you have any more recipe/directions/shopping list sheets? They were EXTREMELY helpful for a newbie like me! I start college tomorrow as a mature student so I wanted to make life really easy at home, i just made these up and they were SOOOO easy and look so tasty i cant wait to try them. Thank you so much. Thanks, this is super helpful! I am planning on cooking the recipes this week in anticipation of back to school time. Just wondering, for the recipes where the meat does not have to be cooked, does it matter if the chicken is frozen when it goes into the freezer bag? I bought defrosted chicken in bulk from costco. It is not frozen. I made these all a few weeks ago- the only meat that we cooked up was for the Enchilada bake and the meat for the Baked Ziti. Everything else we put either fresh or frozen into the ziplocks along with the other ingredients. Since everything is going into the freezer it shouldn’t matter that the meat was fresh versus already frozen. We haven’t had any issues! Hope this helps! I am working on assembling all the recipes, but I am stuck on the cilantro chicken and chicken alfredo. I purchased 3lbs of chicken, but it was only 4 breasts…so I may not have purchased the right thing. I diced and cooked chicken for the white enchilada bake. Do I cook the chicken for the cilantro chicken and alfredo? Or am I supposed to add chicken breasts. I didn’t buy frozen, I bought fresh…so just making sure. You do not need to cook the chicken for the Cilantro Chicken and the Alfredo. The recipe says 3 lbs. of Chicken or around 12 breasts. A serving of chicken is typically 3-4 ounces and these recipes end up shredded so I find that’s plenty, but if you only got 4 breasts for 3 lbs. they were really big pieces and you may need to cut them up or buy additional meat. I’m really looking forward to trying these out! I just have one question…. What sizes of jars and cans do you use for the different recipes, like the alfredo and spaghetti sauce and diced tomatoes? This was great! We are expecting our third child in September so I’m trying to get the hang of freezer meal planning before then. 1. I have the quart size freezer bags – is that large enough? Hi Cristina, no I would get Gallon size bags, and yes you can save leftovers and reheat, but just for a couple of days. I use foodsafety.gov a lot to check how long foods are safe to eat. i love these recipes. but what I really need is a rule of thumb for creating my own recipes and what can or cannot be a freezer meal. If you have something like this please direct me to it’s location. Thank you. I have a Freezer Meals 101 post that might help. Thank you so much for these awesome recipes! I put them all together in freezer bags today! Can’t wait to try them. Just one question…. For the chicken broccoli Alfredo do you put it on the stove on low for 4-6 hours or in a crockpot? Can’t wait to try these. I made several freezer meals while waiting for our baby girl to get here. She arrived last Saturday, and it’s been awesome having meals in the freezer. I was hoping to do more once the once we have run out, and I love the meals you posted. It’s so helpful to have the shopping list already done. Thanks so much for sharing! Once I complete these bags how long will they stay good in my freezer? If you wrap and store them properly, a good rule of thumb is 3-6 months. I just found this today and LOVE it! I’m putting my list together now and going shopping once the kids wake up. Did you ever do more? Thanks! I’m not able open any of the links to the recipes? I’ve loved these meals! the Chili was the best I’ve ever had and will be in our regular rotation. Thanks, making the beef and broccoli tonight and can’t wait! I followed the recipes, but the Chicken Broccoli Alfredo turned out really watery from the frozen chicken and it ruined the meal for me :( I don’t know what I did wrong. Hi Haley, I think the chicken is supposed to be cooked before making the Chicken Broccoli Alfredo, maybe that will help if you make it again? I work until 8 o’clock each evening and this will allow my 16 year old to serve a healthy hot meal to her & her brothers every night. Thank you so much. I’d love to see more. These are brilliant, thank you so much! My husband both work 10 hour shift, he works nights and I work days so sometimes he’s still asleep when I get home at 6pm, freezer meals are going to work awesome for us, I just have one question about one ingredient, the 2 bags of broccoli you say to buy, what size bags are you suggesting, it seems to be the smaller one but I just want to be sure. I think they are about 16 oz? I’m not sure to be honest, my store only has a regular smaller size and then like a Huge one that’s more like Sam’s Size :) Sorry that’s not very helpful but just the single family meal ones work great! Love this! Going to try this week! I love Aldi and am going there tomorrow so I’ll try these recipes, and shopping list. Are there more of these on your blog? Would love to see more! So easy to put together and excited to taste them! Confused on the baked ziti–the whole thing is put together and going in the oven covered for 30 minutes before it goes to the freezer, correct? If so, does it require any additional cooking time when it’s pulled out of the freezer? On the Baked Ziti, you don’t bake before you freeze. You just assemble everything, freeze, then thaw overnight when ready to make and the day of you actually cook it. Do you cook the pasta beforehand as well? Yes, you cook the pasta before you freeze the meal. In your directions you don’t mention thawing out ziti the night before…..we have been cooking for over an hour :(…hope it turns out ok.
Are you supposed to cook the stew meat beforehand too? It says to cook 4 to 5 chicken breasts ahead of time but then the recipes call for 12? Very confusing. Some of the chicken you don’t cook ahead of time, but some of it you do.The shopping list is a total. The recipes are all individual and no you don’t have to cook the stew meat, but some people like to. It is just more time consuming if you do it first. Thanks so much for sharing!!! Please give us MORE weeks of freezer meals! This is SO helpful! I vote YES for more week menus! What are the serving sizes for these meals? I have a family of 2 adults, a 4 year old and a 6 year old + a baby. These feed my family, but if you have teenagers or more people you’ll need to increase the protein portions. I loved this. I did the weeks worth of meals and I’ve been telling friends how great it was. Please post more freezer meals. This was very easy and cleanup was a breeze. I thought it was going to take a lot more effort to get it started. I love your page! I vote “yes” for more !!! Absolutely fantastic. The shopping list with it made this SO easy. I literally printed it and stuck it in my meal binder. Thank Thank you thank you. Woohoo!! This is great!! More please!!! Just made this for dinner and it was a big hit! Thank you thank you! I use your 12 meals for $85 and I love this one too! please keep them coming! Thank you! Looks so delicious, nothing crazy & out of the ordinary, which my kids will love. And it was free! Couldn’t be better. Definitely want to see more! All the recipes look delicious and I am excited to have quick and easy meals when school starts next week! !